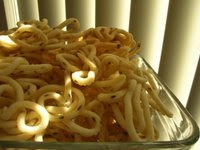 Ghee fried cashews can be added to the sweet. Ghee roast the Rava and keep it aside. Heat water in a heavy kadai. When it starts to boil, add the saffron. You will notice the water turning to yellow color. 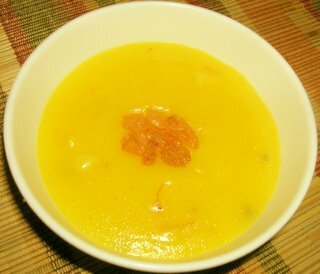 Reduce the heat and add the Rava slowly (keep stirring while adding to avoid lumps). Keep stirring till Rava is fully cooked (At this time the consistency will not be too loose). Now add the sugar slowly, while stirring it at the same time. You will notice the consistency loosening. Add the cardamom. 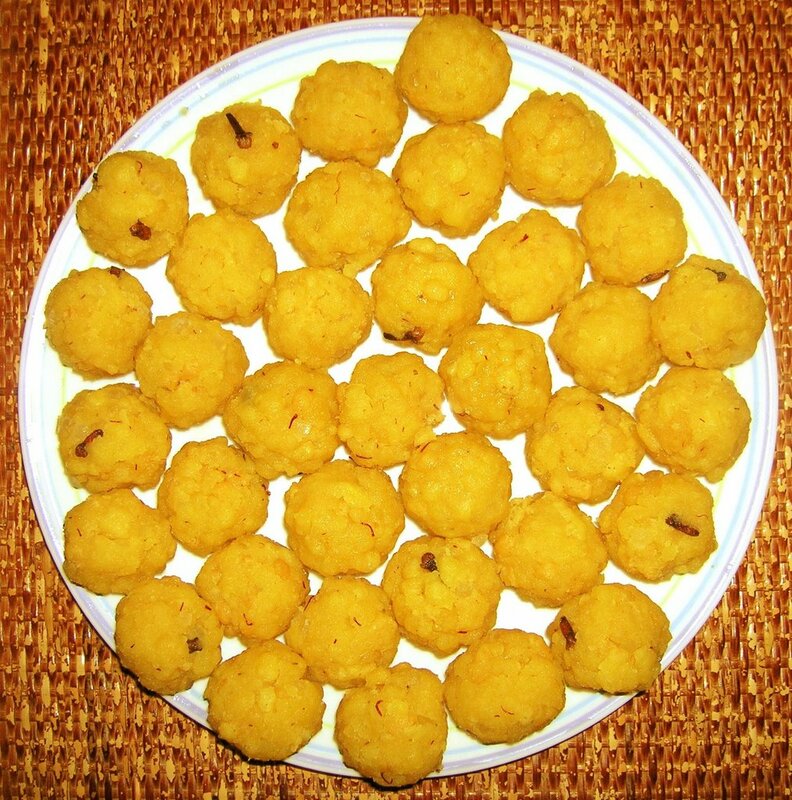 Keep stirring until the kesari thickens. It will start sticking to the bottom. Now, add the Ghee and stir well. A lot of stirring, but worth the effort. Garnish with raisins/cashews. Serve hot or at room temperature. 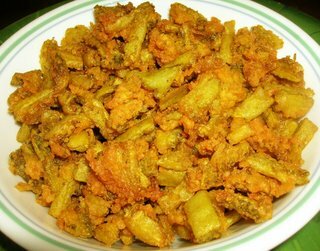 We love to crunch this crispy pakora made of bitter gourd. This pakora can be served with any chutney of your choice and goes very well with curd rice. Scrape pavakka just to take away the spikes. Cut lengthwise and take the seeds out using a spoon. Chop the Pavakka into small ½ inch pieces. Wash the chopped vegetables and add turmeric and salt and mix well. Now Microwave (in a partially opened microwave safe container) in high for 8 minutes to cook the pavakka. Squeeze and drain the water from the pavakka and add besan flour and rice flour along with very little amount of red chilli powder. Mix well. Carefully, deep fry the prepared pavakka and drain excess oil when it turns crispy golden brown. Fry only 2 tablespoon of pavakka at a time, as the sizzling oil will bubble out. This is my entry to Pooja's 'Vegetable of the Week' round up for Bitter gourd. Soak Sprouted Moong Dal and Rice together for 1 hour. Grind the Dal, Rice, Salt, Asafoetida, Red chilli powder and Jeera to smooth batter using very little water. Make thin small dosas using the batter in a Hot Tawa. Keep medium heat. Cook both sides, using little oil/ghee in the sides. 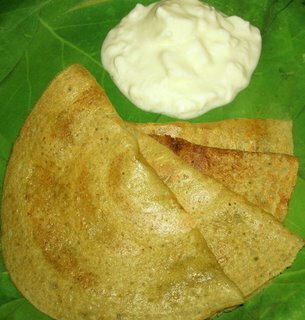 These healthy dosas can be served hot with a dollop of thick curd or any raitha/chutney of your choice. Instead of adding the rice, you can substitute with either 2 tablespoons of rice flour while grinding or mix ½ cup of iddli/dosa batter. Instead of red chilli powder, green chillis can be used. 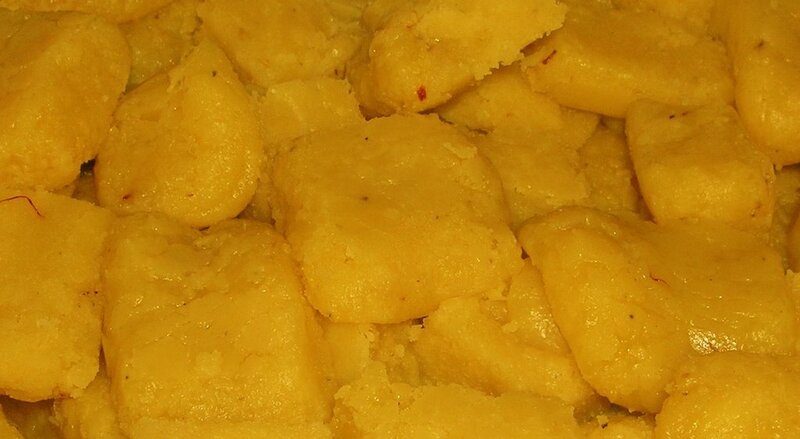 Grated ginger, pepper, finely chopped onions, coriander leaves and curry leaves can be added to the ground batter. This nutritious dosa, is definitely not filling like other Adai varieties, Because, the batter is made thin and the Sprouted moong is not heavy. 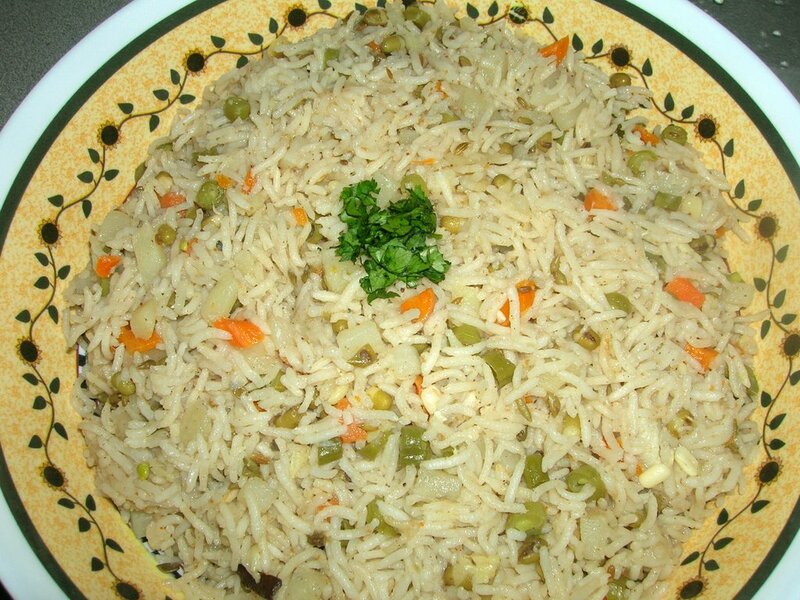 This is a very simple recipe for a Vegetable Pulao, where I have added sprouted moong to make it more nutritious. 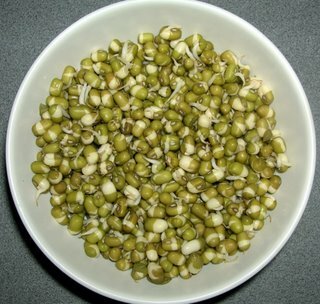 The protein rich sprout is very health-friendly and are excellent to those trying to lose weight and gain energy. I try to add sprouted moong in my diet atleast twice a week. I make a variety of dishes with the moong sprouts of which ‘Sprouted moong in Vegetable Pulao’ is one such recipe. Add all the masala spices and green chillies and stir for a minute. Add the vegetables and then the sprouted moong. Add salt and stir. When everything has heated up, add the basmathi rice and 2 cups water. When it starts to boil add one teaspoon ghee and close the lid. Add 2 cups of warm water. When the water comes to a boil add rice and stir well. 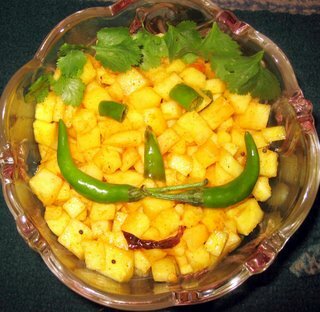 Garnish with coriander leaves and serve hot with favorite raitha or chips. 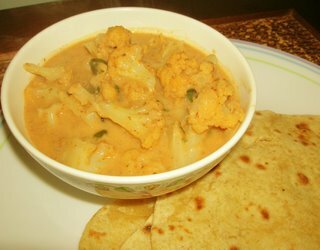 Cauliflower – 1 medium size – chopped into small florets. Grated fresh cononut – 3 table spoon or coconut milk ½ cup can be used. Heat oil in a pressure pan; add aniseed, cinnamon, cloves, bay leaf and the Cauliflower. Fry for a couple of minutes. Now add the ground masala (1) and stir for a minute. Then, add the spice powder (2) and add just enough water to cover the spices. Add salt. When it comes to a boil, close the lid and put the weight on. Pressure cook for 1 whistle. Open the pan after few minutes. Stir in the ground coconut/coconut milk (3). Garnish with coriander and curry leaves. Serve hot with chapathis. In the kurma shown in the above photo, I have added coconut milk instead of ground fresh coconut. Mix the rice flour and besan flour in a mixing bowl. Melt butter and add salt and whisk. Pour it into the flour and mix well. Now add the adafoetida and red chillie powder to the mixture and mix well. Heat a tablespoon of oil and mix it to the flour. When you think everything is evenly distributed, add little water and knead. The dough should not be too thin or thick. Now heat the oil. Apply oil to the inner walls of the presser and fill ¾ of it with the dough. When the oil is ready for frying, squeeze the dough into the oil through the press. You will see the oil bubbling up like soda and then calm down. Fry it until the sizzling calms down completely. At this point the golden colored pakoda will be crispy. Strain the oil. Break it into small pieces and store in an airtight container when it cools completely. 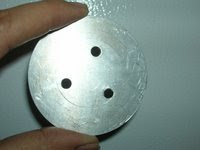 You need a presser, which has 3 small holes. Mix Rice flour and Urud flour in a mixing bowl. Add Asafoetida, Jeera (cumin), Salt. Melt the butter and whisk salt in it and pour it in the flour. Gently mix the flour and add required amount of water to it and knead the dough. The dough should not be too sticky or too hard. Now heat the oil. Apply oil to the inner walls of the presser and fill ¾ of it with the dough. 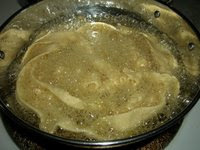 When the oil is ready for frying, squeeze the dough into the oil through the press. 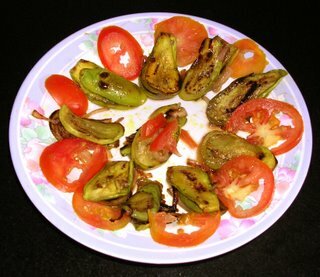 Fry thenkuzhal until it turns crispy. (Don’t let it turn brown). Strain the oil. Store in an airtight container when it cools completely. 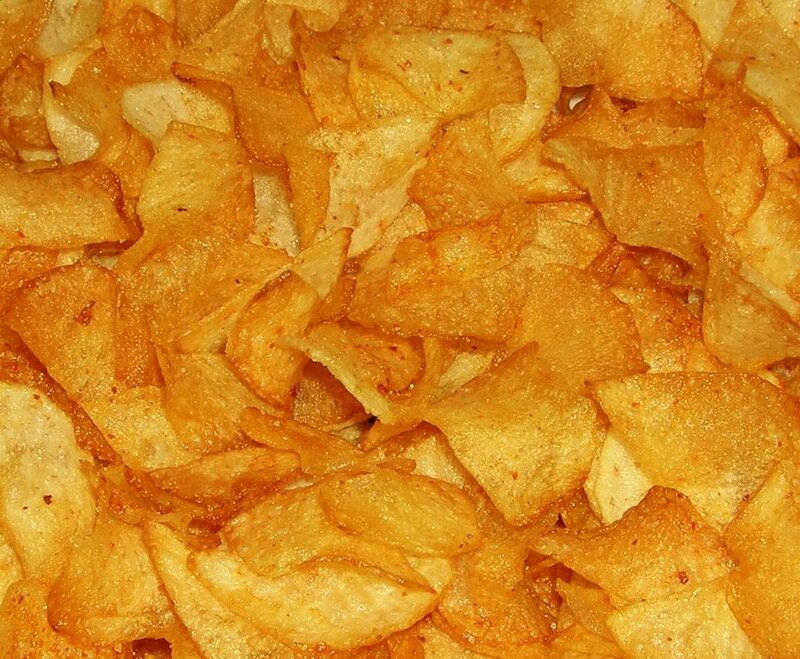 Homemade ‘Potato chips’ is more fresh and tasty than the ones we buy from the stores. 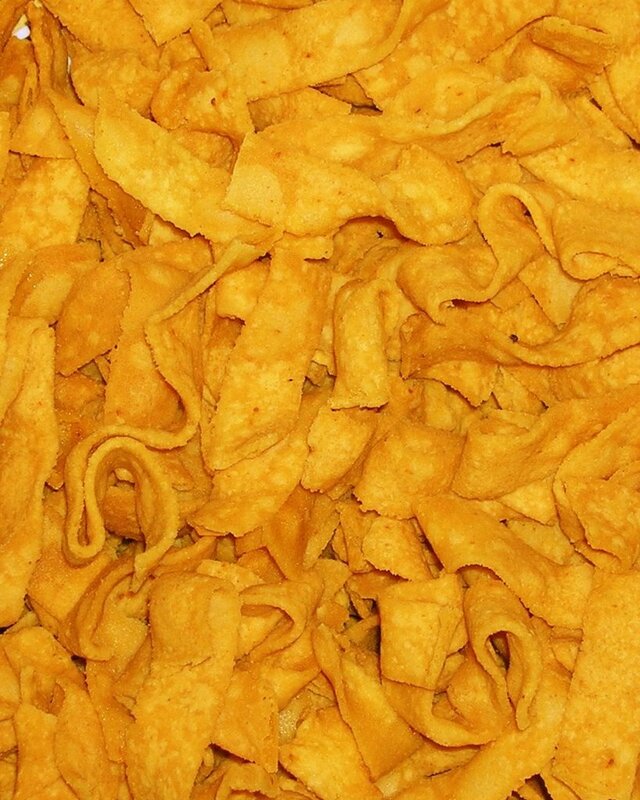 You can customize your chips according to your taste. Here is a recipe for authentic potato chips that I make. Scrape the Potato skin and cut in the middle lengthwise. Heat the oil, and when it’s ready, hold the slicer above the oil, and slice the potato so that the potato falls directly into the hot oil. Slice fast and at the same time be careful. If you slice very slowly, the chips will have thick slices. Fry until its crisp and golden brown. To the fried chips sprinkle salt and red chille powder and mix well. Just omit red chillie powder if you want only salted chips. 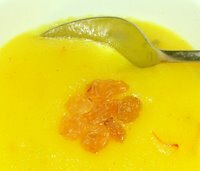 One of my most favorite sweet is Badam Halwa. I like it in any consistency it turns out when it’s done. It might turn out as soft Badam Halwa or can be cut into diamond shapes when cake consistency is reached. To blanch the badam, boil in water for 1 hr in low flame. This way it is easy to peel off the skin. (The traditional way is to soak the badam overnight to peel off the skin). To the blanched Badam add little milk and grind it into a smooth paste. Mix little water to sugar and heat it in a thick bottomed kadai. Add Saffron while it is boiling. 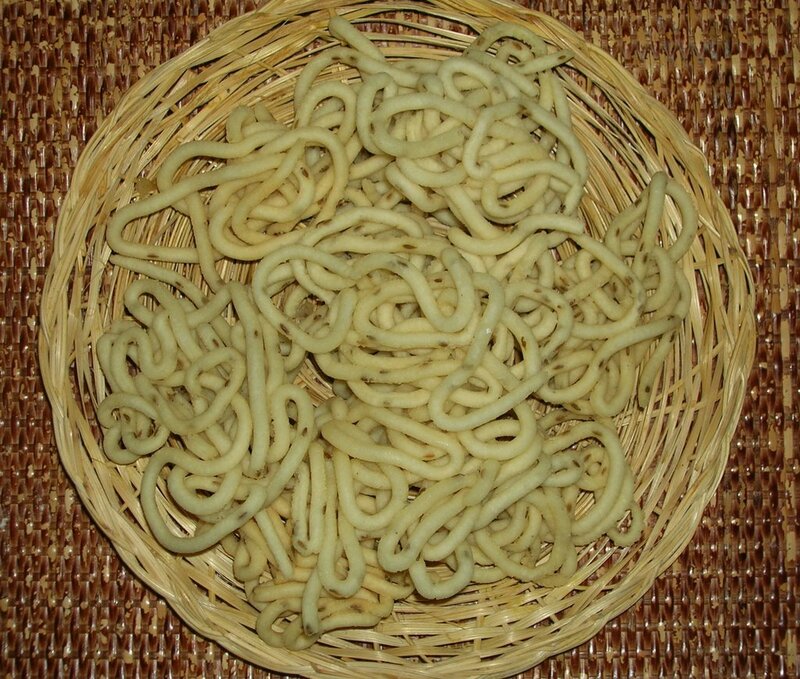 When one string consistency is reached, (One string consistency means, Thin long string is formed upto 2 to 3 inches when tested between thumb and fore finger) add the badam paste and cook till it becomes thick. When Halwa sticks to bottom add ghee little by little and cook till halwa consistency is reached. 1. 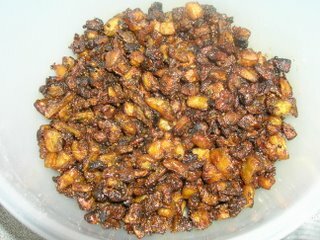 You can mix sugar and badam paste directly and cook it in a heavy kadai. Add ghee when it sticks to the bottom. This method takes long time to cook and absorbs more ghee. 2. You can buy the powdered dry badam (almonds) from the Indian store instead of blanching and grinding the badam. 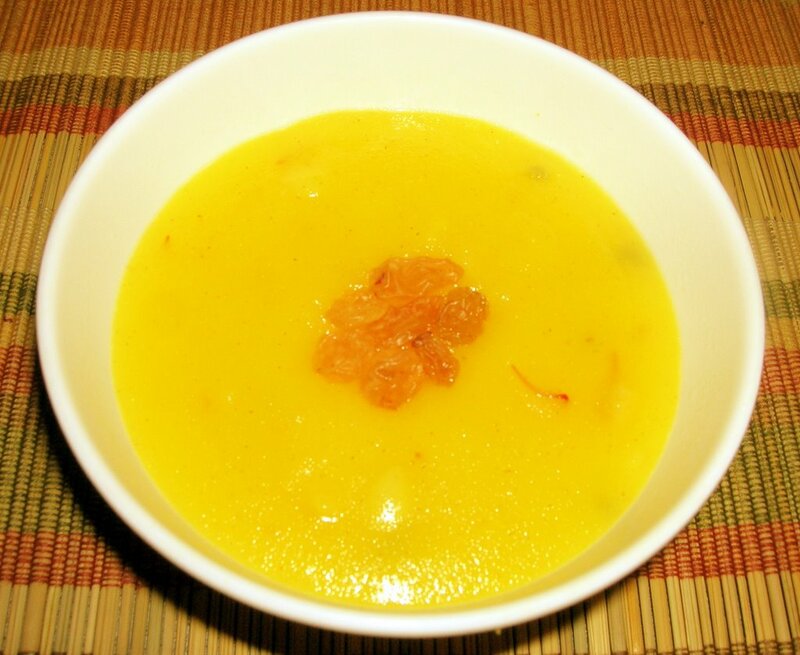 Definitely an acquired taste, bitter gourd is also called Balsam pear or bitter melon. Young immature bitter gourds are the best for cooking: the skin is bright green in color, the flesh inside is white, and the seeds are small and tender. The vegetable is ridged, and the skin is pebbly in texture. Do not use mature bitter gourds, and do not eat bitter gourd if you are pregnant or nursing. Bitter gourd contains vitamin A, B1, B2, and C. It also contains minerals like calcium, phosphorous, iron, copper and potassium. From the ayurvedic perspective, bitter gourd is excellent for balancing Kappa. 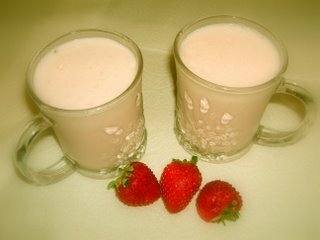 It helps purify blood tissue, enhances digestion, and stimulates the liver. 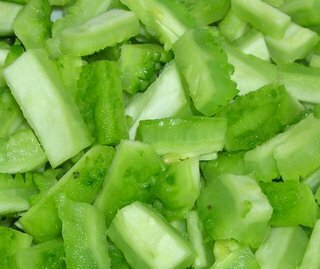 Below is a recipe for Pavakka pickle. 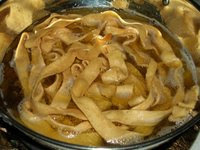 To prepare bitter gourd for cooking, wash thoroughly, then cut in half lengthwise and scrape out the seeds with a sharp spoon or corer and discard. Dice the bitter gourd and add ¾ tea spoon turmeric powder and ¾ tea spoon salt and mix well Keep in a closed container for about 2 hrs. After two hrs, take the mixture and squeeze out water using a towel and pat dry. This process will take away most of the bitterness. 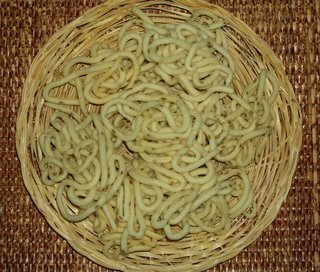 1 teaspoon Fenugreek powder – roast the fenugreek (menthya) seeds (do not roast too much) and powder it. Heat oil in a heavy kadai and add asafoetida, to it add the bitter gourd and sauté well until it becomes crisp. Add the fenugreek powder, tamarind, and red chillie and blend it with the gourd. Add the jaggery/brown sugar to it and mix well. Stir for sometime. Taste for salt. Add a little if needed. This can be cooled completely and has a shelf life of 3 to 4 days when kept in fridge in an airtight container. Goes well with curd rice. One Onion medium sized – diced, not too small. A few Curry leaves and handful of Cilantro. Cook Dhal and keep separately. Heal oil and add mustard seeds, after it sputters, add Jeera, ginger paste, curry leaves and green chilies. Then, add onion and sauté. When it’s done, add tomatoes and sauté for a couple of minutes. Add the cumin powder, dhania powder, turmeric and salt. Stir for 5 minutes or until these blends in. Now add the cooked dhal. Stir well. If you want the dhal to be a little sourer, add lime and stir. Garnish with cilantro. This dhal fry can be served with Rice or Chapathis. 1. 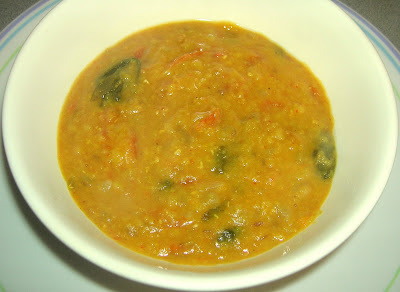 This dhal fry can be made even without onion. Just saute tomatoes and add other ingredients. 2. Do not boil the Dhal after its been added. Just stir till it mixes well. 3. You can use red chillie powder instead of green chillies. Roast the dals separately and grind it with red chillie and cinnamon. Cook rice and allow it to cool. Separate grains. Heat little oil and add mustard seeds, when it sputters, add urud dal. When it starts turning light brown add the capsicum. Sauté in medium heat and when its done add turmeric, salt, asafoetida powder and Cardamom. Stir and now add 2 to 3 spoons of the ground powder. Mix well and now add the cooked rice. 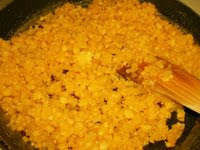 Stir very gently and when its ¾ mixed, add 2-table spoon ghee and then mix again until even distribution. Garnish with cilantro and/or ghee roasted cashews. Serve with Raitha and/or Chips. You can garnish with Ghee fried Cashews as well. While Sautéing the Capsicum, add 1/2 teaspoon Tamarind Concentrate for a different taste. You can make combination rice such as onion and capsicum, onion and potato or with as many types of vegetables as you want. Its all up to your taste. This powder goes well with vegetables like Onion, Potato, Tomato, and Capsicum. 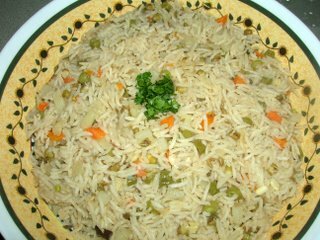 Carrot and peas can be cooked separately and add to the rice to make it more colorful. Wondering how in the an Apple pickle would taste. I felt the same when a friend of mine told me this recipe. I just loved it the first time I tasted. I bet you will too. Its got the juicy, spicy taste. If you are an Apple lover, you sure will love this delicious pickle. It goes very well with Curd rice. If you really liked the pickle, you would sure substitute as a curry for your main course. Here is the recipe. Dice apple into very small cubes. Add the lime juice (optional). Add the turmeric, red chille powders. stir and add salt. Heat the oil and add mustard seeds, after it pops, take it off the heat and add asafoetida to it. 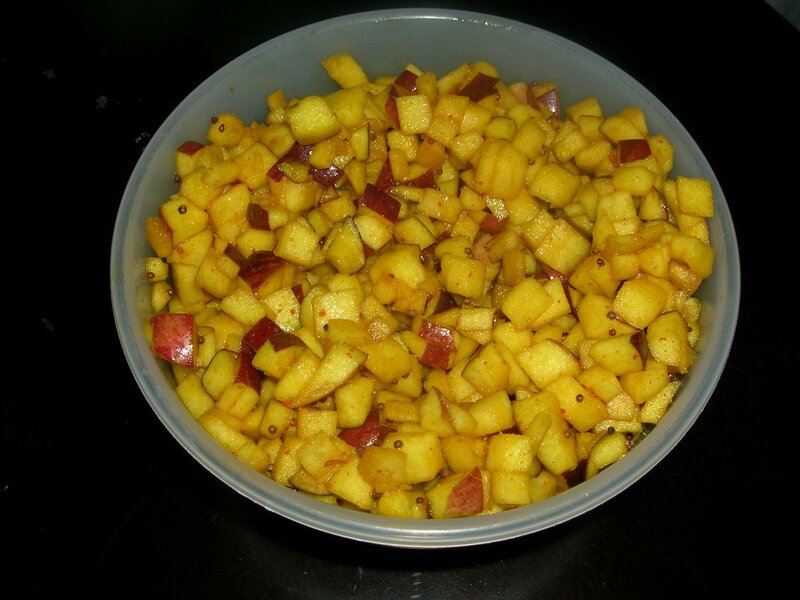 Now, pour the seasoning to the diced apple and mix well. A healthy pickle is ready in an instant. Lasts for a day when kept in the fridge. 1. 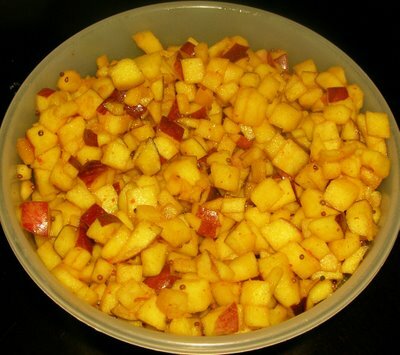 If the apple is too sweet, add more red chillie powder and/or one teaspoon lemon juice. 2. It is not necessary to peel out the skin. 3. You can add green chillie seasoning instead of red chillie powder. 4. Add jeera too in the seasoning, if you like the taste of it. My relative tried this pickle and sent me a photo of how she displayed it. Here is the photo. She is very creative. 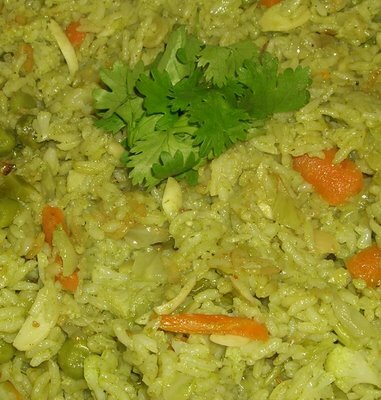 This is a very simple vegetable biryani that I prepare in my favorite Kadai Pressure Cooker. It’s the best I would say. I have electric cooking range in my house. Follow the given procedure to avoid over cooking and to prevent burning. I use Sona masoori rice. 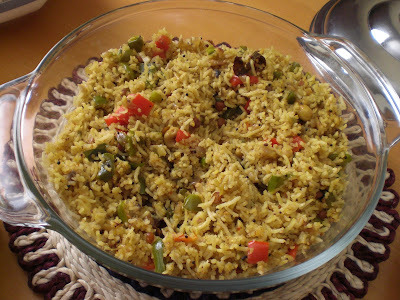 You can also use biryani rice/basmathi rice. Onion medium size – 1 – thinly sliced. Heat oil in a Pressure pan, add jeera and then masala spices. Add onion and when it turns light brown add the ground paste. Stir for a couple of minutes. Add the vegetables and salt. Let the content heat up for sometime. Stir occationally. Garnish the Biryani with coriander leaves. Serve hot with any Raitha and /or chips. 1.You can add sliced almonds to make it more tasty. 2. You can add mint leaves instead of coriander leaves. 3. You can add the mint leaves after sauteing the onion instead of grinding it together with other ingredients.